Even though I’ve been absent from the blog, the second trimester has me feeling good, most notably hungry for my regular healthy foods at mealtimes, and I’ve hit my stride with meal planning. I’m really making an effort to shift to faster, less complicated dinners, and hopefully that effort will get you to try more of the recipes from NCK. I’ve also started doing a little regular cooking for a friend (or a new client, I suppose you could say) who has the most huggable newborn twins I’ve ever seen. She had been ordering vegan meals, and it’s not that they were SO atrocious, but when you’re on a twin newborn schedule I think you start to want delicious, balanced meals when it comes time to eat, even if it means taking the baby weight loss at a normal (instead of Beyoncé-like) pace. I’m sending her my weekly dinner plan ahead of time, and she chooses three or four of the meals that I cook for her and her hubs (I’m sure the twins would like in on some veggie burgers, if they had a say in it). Sounds complicated, and I admit I went a little overboard this week, but I think the whole menu is actually easier than it sounds. You’ll have to judge for yourself when I publish the recipes. What else are Steve and I eating this week? Tonight is broccoli, pepper, and lentil calzones with smoked mozzarella and a side of marinara, and Monday we had this twist on the burrito bowl! For being healthy, the rice came out nearly as addictive as Chipotle’s version. The rice, beans, and fajita veggies can all be made ahead for this dinner. If you’re pressed for time this week, double the recipe so you have leftovers for lunches or other dinners. A big cast iron skillet is one of my kitchen staples (constantly sitting out on the stove), and is perfect for cooking both the veggies and beans in this recipe. Gluten free and vegan. A two-pan Tex Mex dinner recipe made with lots of pantry ingredients you probably have on hand already (or with easy substitutions). 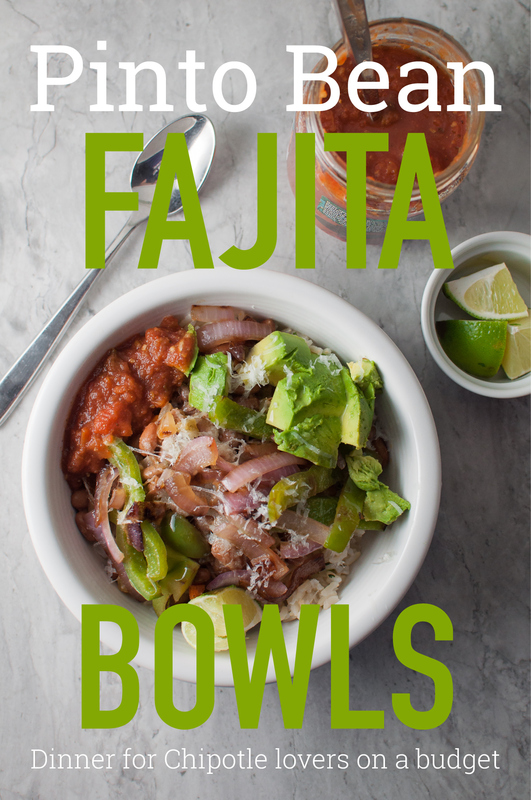 It also satisfies the Chipotle craving in a little healthier way. Zest one of the limes. Cook the rice using this method, or according to package directions, adding the lime zest with the rice. While the rice cooks, sauté the sliced onion and bell pepper in a couple teaspoons of hot oil over medium high heat in a large skillet. Once browned on the outside and still slightly crisp, season with salt and pepper and transfer to a plate. Cover with foil or place in a warm (180 F) oven. In the same skillet, heat a tablespoon of oil over medium. Add the chopped onion and carrot/celery and cook until beginning to soften. Add the garlic, dry spices, and a generous pinch of salt and cook another two minutes, stirring often. Add beans and water, bring to a boil, then reduce heat to a simmer. Cook about 10 to 15 minutes, smashing some of the beans with a wooden spoon every time you stir, which will thicken the sauce. Remove from heat and season to taste with salt and pepper. When the rice is done, stir in the juice of half (or one whole) lime, salt to taste, and cilantro, if using. 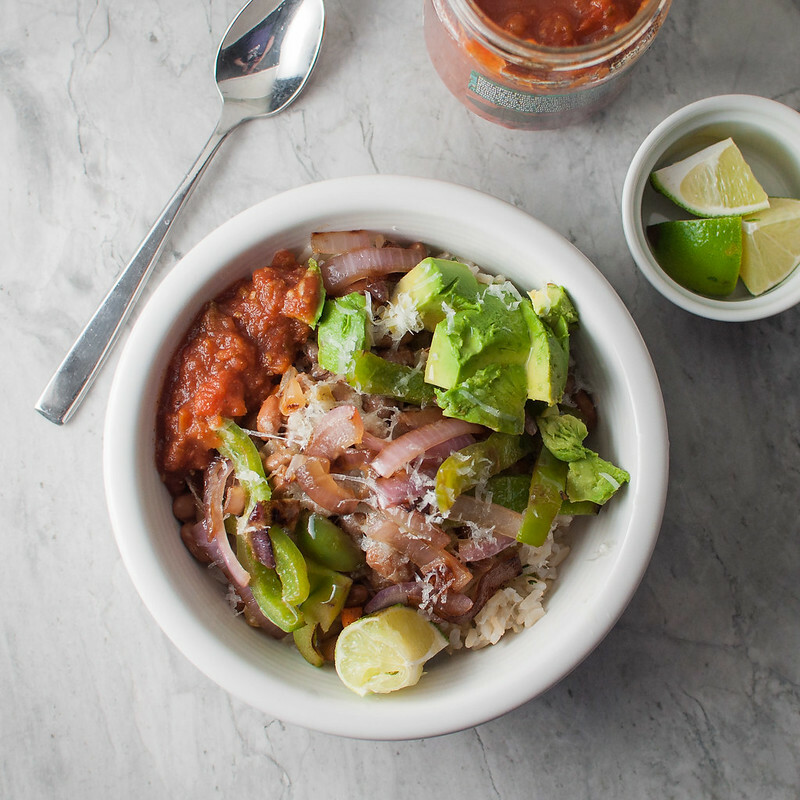 Assemble each bowl with a big scoop of rice, some beans, a quarter of the veggies, a sprinkle of cheese, and one quarter of the avocado. Serve salsa and the remaining lime, quartered, at the table. Note: This page contains affiliate links. It does NOT contain sponsored content. Affiliate links (to products I recommend, on Amazon) offset my ingredient and website maintenance costs, so I can keep bringing you make ahead recipes like this one. Thanks!